The eight 1-bedroom tents offer a high standard of comfort, featuring one main bedroom and an en-suite bathroom. The roll-up canvas allow to admire the vast panorama. The two 2-bedroom tents are particularly suitable for families. Facing out over the spectacularly beautiful desert, they offer two wide double bedrooms with en-suite bathrooms and a shared living room. Nestled on the Southern edge of the Namibian desert in the Karas region within an extraordinary Nature Reserve, Sonop is created in the form of a luxurious tented camp constructed on top of boulders. 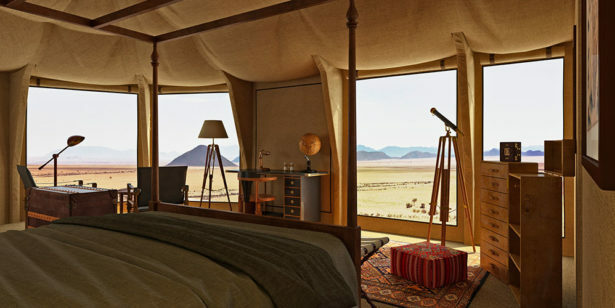 Ten lavish tents invite guests to live the life of yesteryear’s wealthy explorers from the early 20thcentury. Just like those travellers who traded their beloved homes for the bare Namibian desert dunes, the guests of Sonop will get a taste of living in complete isolation while enjoying the comfort of their accommodation. Opening is planned Summer 2019.